Alforon prepares some the freshest Lebanese food around, everything is prepared on location daily, from our Humous and Tabouli to Baba Ghannouj, Fattoush, Garlic paste, Falafel, Tahini sauce, Kaack Bread and our made to order flat sandwiches, with amazing ingredients, perfect for a wide range of palates and tastes. Some are spicy, some are mild but none are bland, they are all interesting to all original and authentic food lovers. Alforon’s commitment to freshness and quality will amaze and impress any food critic or food connoisseur. We make our food for the fun of making it and the joy of watching our clients enjoying it, not commercialize it with big profits, our extremely reasonable and low prices are a big indication. This is why we make a point to talk to each one of our customers to ensure their satisfaction in every visit. Among the common spellings for this word as transliterated into English are hummus, hommos and hoummos. The spelling humus is generally avoided in English as it is a homonym of humus (organic matter in soil), though this is the usual Turkish spelling and the OED indicates the word entered the English language from Turkish. The full Arabic name of the prepared spread is حُمُّص بطحينة (ḥummuṣ bi tahina) which means chickpeas with tahini. Many cuisine-related sources carry forward a folklore which describes hummus as one of the oldest known prepared foods with a long history in the Middle East stretching back to antiquity, but its historical origins are unknown. The historical enigma is such that the origins of hummus-bi-tahini could be much more recent than is widely believed. One of the earliest verifiable descriptions of hummus comes from 18th-century Damascus and the same source claims it was unknown elsewhere. Meanwhile some cookbooks repeat the legend that hummus was first prepared in the 12th century by Saladdin. Sources such as Cooking in Ancient Civilizations by Cathy K. Kaufman carry speculative recipes for an ancient Egyptian hummus, substituting vinegar for lemon juice, but acknowledge we do not know how the Egyptians ate their chick-peas. Similarly, no recipe for hummus has been identified among the many books on cooking surviving from ancient Rome. Charles Perry, co-author of Medieval Arab Cookery notes that owing to hummus bi tahina being an everyday staple, and because of the lack of Arab recipe books published between the 14th and 20th centuries, no recipes documenting this food’s early ingredients have been found. He says the nearest medieval example recorded in a 13th century Arab cookbook, Kitab Wasf al-Atima al-Mutada is Hummus kasa, which substitutes vinegar for lemon, includes extra herbs and adds walnuts. It is known that the Lebanese cuisine expanded on many of these traditions and added the various flavors of this amazing dip, creating a variety and additions like meat, pine nuts and other toppings to the dish. Manakeesh or Manaeesh… A little fact. (Arabic: مناقيش‎ manāqīsh; sometimes called معجنات mu‘ajjanāt ‘pastry’) is a popular food consisting of dough topped with wild thyme, cheese, or ground meat. Similar to a pizza, it can be sliced or folded, and it can either be served for breakfast or lunch. The word manaqish is the plural of the Arabic word manqūshah (from the root verb naqasha ‘to sculpt, carve out’), meaning that after the dough has been rolled flat, it is pressed by the fingertips to create little dips for the topping to lie in. Traditionally, Arab women would bake dough in a communal oven in the morning, to provide their family with their daily bread needs, and would prepare smaller portions of dough with different toppings for breakfast at this time. Cheese (Arabic: جبنة, jubnah). Another type has Akawi cheese toppings instead, and it is a bit more expensive than the thyme manakish. Minced lamb (Arabic: لحم بعجين, laḥm bi-‘ajīn, “meat with dough, sfiha). Other manakish are served for lunch because of their heavier contents. This popular manakish has lamb topping. The minced lamb is mixed with tiny pieces of diced tomato and vegetable oil, and this manakish is optionally served with ground pepper or pickles and yogurt. 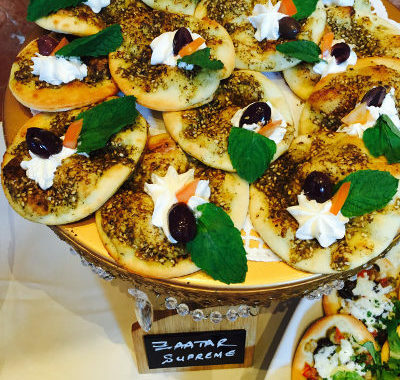 Manakish can be prepared pizza-style with a variety of fancy toppings. These may include cheese, meat (beef or turkey), mushrooms, labneh, cheese with honey, or chocolate with bananas. “ALFORON” will take you back in a Journey to our Old Country of Lebanon in a beautiful setting, a friendly smile and our family’s warm Welcome, top it all with a Great Value Menu. San Diego’s first of its kind, “ALFORON” Brings you our freshly made Manakeesh or Flat Bread Sandwiches from the finest of ingredients, Baked daily in our State of the Art Brick Oven. Come taste what has been missing in San Diego County. it is finally here and it’s just like it used to be in the Old Country. We make our own Yogurt, Aayran and Labni on location, we use the highest quality ingredients, and most of all we only use HALAL meat from the best sources in Southern California. We Import the Zaatar and Summac Spices from the old country Our Garlic Paste is one testament of the original flavors of old Lebanon. Our Tabouli and Fattoush Salads are always fresh and made to order never pre-prepared.. our Sausages are all made from Lean Halal meat never stuffed in links, you can see the meat spread on your flat bread and taste its freshness. Our kenefeh is served every Saturday and Sunday. Have on a plate or have it the Lebanese way stuffed in our Traditional Kaack, made fresh on location. our Manakeesh are sure to bring back memories to you and your families and introduce these flavors to your kids and the new generations who had never experienced what our generation has experienced. We are sure your experience will be a great one, in fact we guarantee you it in every visit. We want to thank everyone for their encouragements and look forward to serving you in our Alforon soon. Old Country Cooking using the Highest Quality local and imported ingredients. Alforon will take you back on a Journey to 19th century Lebanon with the Flavors and Freshness of Old Time. Always fresh, always delicious. We will take care of all your Catering needs.